Almost everyone has lingering questions that they are afraid to ask or just don’t know who to ask. 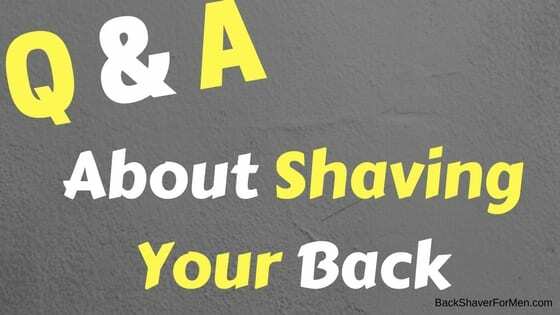 I wish to help clear up some misconceptions pertaining to…you guess it, shaving your back. What gave it away? The title? Does shaving your back cause hair to grow back faster? 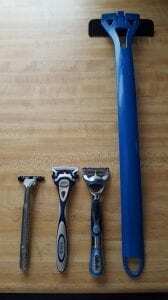 Nope, shaving has no impact on its growth rate, its thickness, or color. So, if you decide to shave your back, it’s a big decision (I know), your hair will not grow back faster, change its thickness or turn it a different color. The hair you see is dead, and shaving doesn’t affect the living part of the hair, which is deep under your skin. Another reason hair seems to grow back thicker and darker is because shaving leaves a blunt angle on the hair follicle giving it the perspective of looking darker and thicker. So, go forth with no fear of making your problem worse. It’s been a wife’s tale for generations and has been proven wrong many times. Can I Shave My Back By Myself? This is liberating. If you’re anything like me, you’re a do it yourself kind of person. You just feel comfortable handling it on your own and saving yourself from possible embarrassment and peoples judgment. Many people have designed and invented ways to very effectively to address the problem of shaving one’s own back…and yes, the work great! I love the baKblade and recommend it every chance I get. It does the best job of shaving your back that I have found yet. You can read my full review of baKblade here, What Is baKblade? If you’re looking for an electric back shaver, I highly recommend you check out my review of the Mangroomer here, ManGroomer Lithium Back Shaver Review. This sucker really surprised me on how effective it worked and the well thought out design. A great addition to any mans back hair arsenal. There are others options too, and you can find them under Reviews tab above. Does Shaving Dry Your Skin Out? When the act of shaving any part of the body you are taking off hair as well as a layer of skin cells. This layer of skin is generally a layer of dead cells that are on the outer surface of your skin. The act of removing this layer of cells is not taking moisture away from your skin in this process. 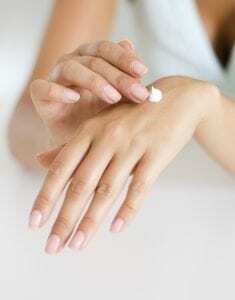 In all likelihood you are using some kind of lotion or shaving cream to help reduce irritation, it is using this creams and lotion that is probably removing essential oils from your skin. The importance of these oils is to help maintain the natural oil of your skin. Also, different areas of your body, have different levels of oil in your skin. Like legs produce a small quantity of oils, while the face probably produces the most. Do I Shave My Back Wet Or Dry? The answer to this question is varied, as it depends on the shaver that is going to be shaving the back. We all should be aware that shaving one’s face is often easier when the hair on the face is properly prepared before shaving. Allowed to soften with warm or hot water for 10 to 15 minutes, this allows for shaving to be much easier. As this softens the coarse hair of the face. Now, back hair, in general, is softer than facial hair, in most cases. Sometimes the back hair doesn’t need softening. It all depends on the individual. A simple rule is to always follow the manufacturer’s suggestions and instructions, to get the closest shave and best shave possible. Normally, they put a lot of research into this, so don’t discredit their information. Some shavers need a clean wet freshly showered back to work the best for that shaver. My suggestion is to try after a shower and once dry. See what method provides the closer shave. See If your nick your back up with one method over the other method. Is your skin more irritated after dry or wet shaving? Pay attention to this little details. Experiment if you’re not getting the results you want, a little tweak here and there can vastly improve outcome. Does Having A Shaved Back Increase Performance? Depends on the sport, though. 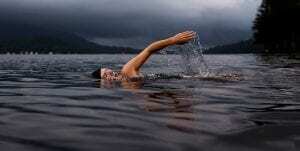 That is, in certain sports like swimming, cycling, and bodybuilding. Where reducing the amount of hair reduces the amount of friction and drag. When body parts are shaved it can more than likely improve performance. In the case of bodybuilding, hair is distracting and blurs the lines, that are optimal to looking aesthetically pleasing in bodybuilding. Where it increase definition removing hair. Do Some Women Have Hairy Backs? Yes, and show some sympathy to the ladies with this problem. Although a lot rarer than a man with hairy backs, some women have hair on their backs due to their ethnicity or genetics. It’s hard enough for a man, now imagine how hard it is for women. What Is So Wrong With Back Hair? Truthfully…nothing. It’s just a natural part of who some people are. But society norms, make natural traits of some people unacceptable. In order to better fit in people alter their outward appearances in order to fit in socially. People usually see back hair as funny or disgusting. Neither puts the person sporting the back fur in a good light and is often looked down upon. I remember growing up watching wrestling and there was a wrestler named George “The Animal” Steele, with a bald head, a really hairy back, green tongue, and acting slow mentally. This for sure didn’t portray hairy backs in a good light but did provide a very entertaining Saturday morning sitting in front of the TV. In some cases, removal of hair helps with body odor, as odor can cling to hair more easily. So, removal of hair helps with body odor issues in some cases. It comes down to personal taste as well, I feel my back looks nicer when it is shaved as compared to hairy. It is unattractive to me, and I am cursed with it. The first time I shaved my back, I found I could see a level of muscle and definition that I had thought I had lost and I really enjoyed the new look. Some people also like hairy. Hairy backs, hairy chest, and even Harry Caray. It’s up to the individual. Why Don’t More Men Take Care Of Their Back Hair? Most men are unaware of the current options available to people with beaver pelts on their back. Just like most men don’t like to ask for directions, most men don’t like to ask for help in dealing with their hairy backs. As there are more and more option to handle this nowadays. Women, for the most part, have no problem asking for direction or going to a salon to deal with hair problems. Men are a different kind of beast and for the most part like to deal with it on their own. Once they find out there is an option for them, they are more apt to address it, especially when it can be done by themselves. This is and was the case for me, and is why I partially created this website, to promote and help other men find a method if they choose to elect to deal with a hairy back. Hope this helps to get the word out to men looking to rid their backs of hair and also to help improve acceptance of people that want to keep the hair on their backs. If you have any question or comments, I always welcome either on my websites. Thanks.